Last fall, when we were approached by Laura Nanni, Artistic and Managing Director of SummerWorks Performance Festival, about curating a performance as part of the 2019 edition of Progress, we knew right away that we wanted to work with Bruno Capinan. This was in November 2018, in the time right after the right-wing extremist Jair Bolsonaro was elected as president of Brazil. Capinan had just published a widely distributed OpEd in The Globe & Mail titled “In Jair Bolsonaro, we are seeing a truer reflection of what Brazil really is”. 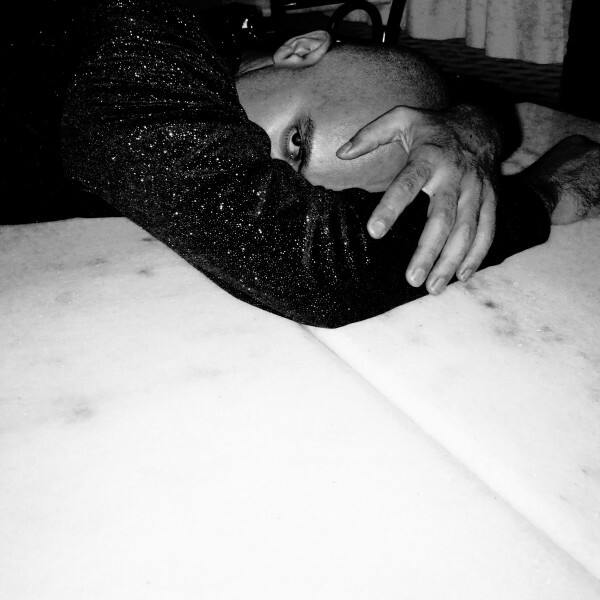 The piece is gut wrenching and eye opening, detailing some of his story as a young, gay, Afro-Brazilian growing up without acceptance and eventually fleeing to Canada as a refugee.Now… we’ve known Bruno both personally and professionally for many years. In fact, Uma Nota has worked with him a number of times in the past, in both his solo project and during his time as lead singer of Mar Aberto Soundsystem. Most recently we booked him as the opening act for our sold out concert with Liniker e os Caramelows last July. His unique voice and style have been intriguing to us both on and off stage. But this article, with it’s glimpse into his personal history and politics made us want to delve deeper into his performance as an act of creative resistance in the face of rising populism, both in Brazil and here in Canada.As it happens, Capinan was in the final stages of recording his upcoming album ‘real’, and was eager to give Toronto audiences a first listen, so our presentation of ‘real real’ was born. We teamed up with VJ Notivago (currently on tour in Brazil doing video for Anitta! 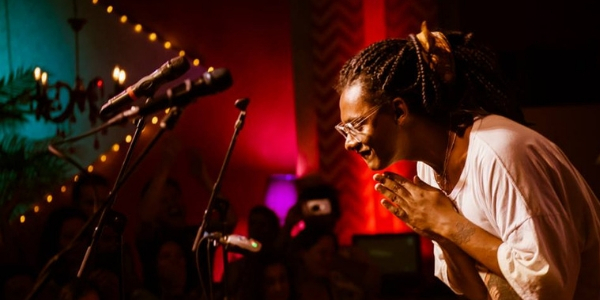 ), to create original video for the show tying in some of the themes that he explores in his music and through his own narrative.Bruno will be performing with João Leão (synth and guitar) and a three piece string section featuring Tanya Charles (violin), Mariel Gonzalez (cello), and Brielle Goheen (viola). The show plays one night only, Saturday February 16th at The Theatre Centre as part of the fourth edition of Progress, an international festival of performance and ideas that brings together progressive performance work from across the globe and expands the conversation around possibilities for performance and form. A bit more about Progress...Innovative in its programming model, Progress is collectively curated. Abandoning the traditional notion of singular, top-down artistic direction, the Festival brings together a different collection of curatorial partner organizations each year, enabling a diversity of perspective and representation that reflects the complexity and diversity of contemporary society. 2019 curatorial partners partners include the red light district, Native Earth Performing Arts, Uma Nota Culture, The Power Plant, FADO Performance Art Centre, SummerWorks Performance Festival, The Theatre Centre, and Why Not Theatre.Uma Nota will also be partnering with Progress on the festival’s closing party. The party starts at 10 (right after real real), at The Theatre Centre and features DJ Hadara (formerly J.Lai), and a live performance from Toronto’s best hidden secret, Nego Mozambique. We’ve been wanting to hear some new music from Nego Mozambique for a while now!! This party is free and not-to-be-missed. Stay tuned here for more on the party later this week!Tickets: $25To learn more.. Check out this interview in yohomo with Zymbul Fkara. The Uma Nota energia is strong in this one!Together with Batuki Music, a presenter of African music and art, join us for our Polyphonic Ground co-presentation of Beny Esguerra & New Tradition, Matatu Express, and The Future Primitive at Revival Bar on Thursday, October 12, 2017.Matatu Express will bless us with Ghanaian highlife and palm wine, East African benga and rumba, Malagasy salegy and blues, while the fiery Beny Esguerra & New Tradition Music mix live hip-hop/RnB soul with an Afro-Colombian percussive edge. The Future Primitive (with our own founding resident DJ and graphic artist General Eclectic on the drum kit) fuse classic Latin American and Caribbean styles with raw, emotive and catchy songwriting into a blend they call “Tropical Soul” music.This show has everything to do with why we started Uma Nota. When our events started at the Gladstone, we'd have parties with live acts like a West African drumming and dance on the same bill as our resident Afro-Brazilian Maracatu percussion group and a guest DJ spinning hip-hop and classic funk.Now we have a new opportunity to participate in a widening of our musical and cultural lens here in the city as one of the collective of presenters behind the new musical discovery series Polyphonic Ground. 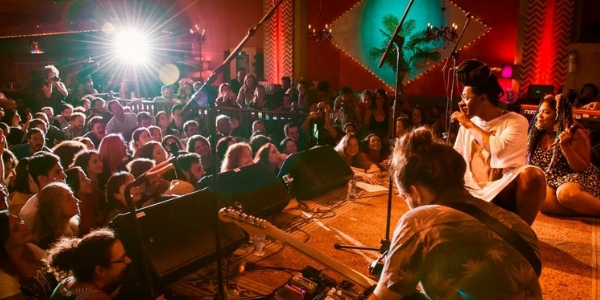 With this initiative, a project under the Small World Music Society umbrella, we're able to bring more bands playing even more sounds to a bigger stage, and pair up with new collaborators and important artists in our communities. Starting off our Polyphonic night is Beny Esguerra & New Tradition, an interactive project exploring the concepts of tradition and change through the production of a multidisciplinary performance featuring spoken word, music, song, dance and design. Best described as: afro-native Colombian music from an inner city perspective via Jane-Finch, Tkaronto. Ancestral musical styles + urban cultural expressions = New Tradition. “The story or prophecy says at one point there were no borders, and the condor and the eagle were united. Around the time of colonization, when the land began to be divided, the condor went towards the south and eagle went towards the north. Now we’re in the cycle where the prophecy says that we’re coming back together as we go back to our traditional ways,” explains Beny Esguerra, a Bogotá-born, Toronto-based spoken words artist and arts educator. 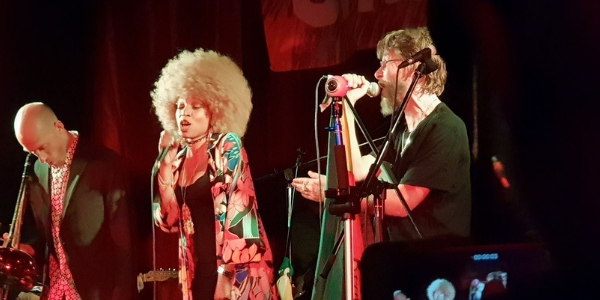 There's a new initiative to help connect the oodles of culturally diverse music we have here in Toronto with audiences who are "culturally curious" and looking for these kinds of discoveries right here in our city. Uma Nota is proud to be a part of Polyphonic Ground, a freshly formed collaboration between 12 local music presenters who, like us, are "committed to building and sustaining Toronto as a global music city. "Here are a few of the key points, as mentioned in the recent press release, and a little bit about how and why we're opting into this initiative.The missionPolyphonic Ground strives to "provide points of connection for artists and audiences, strengthen industry practices and be a united voice to government, business and industry. " This means strength in numbers. It means we'll shout out one another's events from time to time, work together on issues like access to cultural sector resources and grant opportunities, improving conditions around putting on special events like music and arts festivals in Toronto and other key matters that affect all of us as small- to medium-sized presenters.In a recent article in NOW Magazine, our colleague Kayla McGee, who is the managing director of Small World Music and the community lead for Polyphonic Ground, notes that we in Toronto lack any real "infrastructure for live music presenters" and, until now, there haven't been "shared platforms to allow us to work and grow together." "We want to present live music that draws in the culturally curious," says McGee. "With the double-bill series, we encourage audience curiosity, discovery and an exploration of the amazing array of musical talents available to Toronto audiences. Audiences can experience African and Persian music together in one night, or Latin vibes and Indigenous drums, or Bollywood and Klezmer. The possibilities are endless." The partnersOur partners in this new collaboration include many familiar local presenters. Some are organizations with whom we've already co-produced shows and events, and others with whom we're looking forward to a closer working relationship.The initial 12 member organizations involved in Polyphonic Ground are: Ashkenaz Foundation, Batuki Music Society, Good Kind Productions, iNative, Link Music Lab, Lula Music & Arts Centre, MonstrARTity Creative Community, Music Africa, Revolutions Per Minute, Small World Music Society and World Fiddle Day Toronto, along with Uma Nota Culture (our official production company name -- yes, it's also our social media handle).The music seriesWe've long been champions of musical discoveries, especially at our events where someone might come to check out their friend drumming away in a Brazilian percussion troupe, and take in a great Afrobeat band or a local DJ who spins rare dub. In that same spirit of discovery, the first Polyphonic Ground concert series kicks off this fall. In this series, two of the partner organizations will be paired up to co-produce a double-bill that aims to introduce audiences to new music from right here in Toronto. 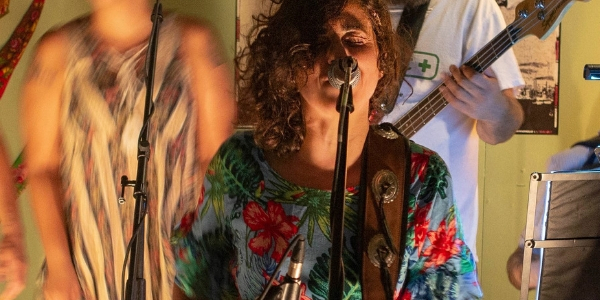 These monthly concerts, designed to foster widespread musical discovery in the city, begin on September 14 with Ashkenaz Foundation and Small World Music Society, followed by Batuki Music and Uma Nota presenting on October 12, Link Music Lab and Good Kind Productions present November 9, and Lula Music & Arts and Music Africa co-presenting December 14. These events will take place at Revival Bar, 783 College St., on the second Thursday of the month starting in September. Artists will be announced soon. The growth opportunitiesThis isn't only a new concert series. The initiative also has the goal of increasing "access to training and leadership and bolstering professional development opportunities within the music industry." Here's a bit of what that looks like, for starters: An upcoming Diversity & Live Music panel discussion series; a Developing Diverse Leaders program "with the goal of empowering young talent through mentorship"; and Best Practice Workshops led by music industry experts.The take-awayIn short: This is gonna be awesome.Sign up for the Polyphonic Ground newsletter and follow PG on Facebook, Instagram and Twitter via the website.And stay tuned for our October 12 show announcement with Batuki Music Society as part of the initial concert series. (Update Sept. 25: lineup and tickets here; new post coming up) Video: Maracatu Mar Aberto and special guests perform on the Small World Music stage in a "Brazilian Grooves" concert co-produced by Uma Nota Culture and the Small World Music Society as part of in/future, a transformational art experience that took place on the West Island of Ontario Place in September 2016. Vox Sambou is the real deal: A sharp-witted lyricist and classy showman who is charismatic, unflinching, passionate and compassionate. The Montreal-based MC has been called "the eternal voice of Haiti," a "Haitian hip hop ambassador" and a "key figure on the progressive front of the Rap Kreyòl movement" whose "boundless energy" on stage with his six-piece band can easily win over the crowd. Vox and his projects represent many of this writer's favourite qualities of Montreal's music scene: Diverse, collaborative and especially multi-lingual. A founding member of the city's revered Nomadic Massive collective, Vox has already released two solo albums -- solo debut Lakay and 2013's Dyasporafriken -- and is poised to release his third solo effort The Brazil Session this fall. In fact the disc has had release parties, in Ottawa and more recently in São Paulo, where the album was recorded. 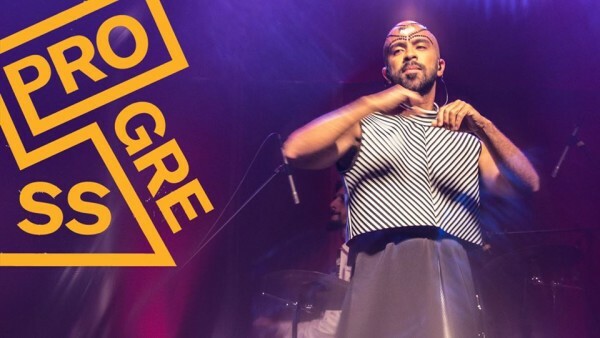 Longtime Brazilian hip hop collaborators Gaspar from Z'Africa Brasil (video) and MC Rael da Rima, who are on the album, participated in the Sampa show. Soon enough The Brazil Session will also be commercially available, but here's a taste from the good folks at Afropop. [Blog/matéria em Português aqui. ][soundcloud url="https://api.soundcloud.com/tracks/219647972" params="auto_play=false&hide_related=false&show_comments=true&show_user=true&show_reposts=false&visual=true" width="100%" height="150" iframe="true" /] No stranger to Brazilian additions to his music, Vox's sound is a unique hip hop fusion, mixing up the beats with traditional Haitian music, lots of reggae vibes, Afrobeat, various other formes of Latin music, and danceable jazz. Now with The Brazil Session he adds extra swing from three Brazilian musicians -- MC Rael, Felippe Pipeta (trumpet) and Cauê Vieira (saxophone, flute) -- alongside Gaspar, guest percussionists, and behind it all, Vox's Canadian band, including Malika Tirolien, who's performed with Cirque du Soleil and recorded with Snarky Puppy, and David Ryshpan of Montreal's Trio Bruxo. A hard-working, prolific artist and old-schooler on the Montreal scene, Vox also plays a key role linking Haitian and Canadian artists. He co-founded the initiave Solid'Ayiti after the devastating 2010 earthquake, to help "build long-term solidarity between people in Montreal and Haiti around the pillars of education, self-sufficiency, independence, social justice and peace." Vox's lyrics denounce injustice in Haiti and worldwide, and he's a committed activist, taking on topics like the struggle against AIDS in the song DiscriminaSida (video), released on World AIDS Day 2009.Or take Blackitude, a tune released in 2012 with a video shot in the Dominican Republic. Vox writes that it was "inspired by Nelson Maca, poet, professor and activist in Salvador da Bahia, Brazil. The song’s theme is ‘negritude’ and the larger African diaspora.” Many of the themes and musical references carry over from his last album, 2013's Dyasporafriken, on which some of the same collaborators appear. Tribal drums, hip hop beats, Afrobeat licks ... name the sounds and Vox will make 'em work together. Dyasporafriken by Vox Sambou Vox is also an incredible live performer. It's easy to see how much energy, sweat, love and fiery artistry he puts into his shows. On stage, in the studio or on the street, this is one cat you want to keep on your radar.Vox Sambou performs on October 17th for the Saturday Jamboree at Geary Lane as part of the fifth annual Uma Nota Festival.